At Military-Money-Matters.com, we hope you'll share this site with military families you know. We'd consider that the ultimate compliment! We strive to provide a comprehensive resource for military families regarding their unique financial issues. And we hope you'll tell us what you want to find here by using the link at the bottom of the page. 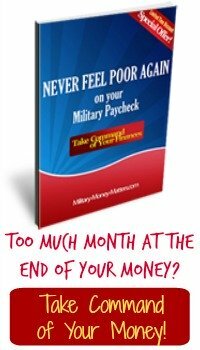 Copy and paste this link into your e-mail: www.Military-Money-Matters.com. That link will send them to our home page. If you have your own website, or blog, or mySpace or Facebook page, etc., please feel free to link to this site. We'd like to get the information here to as many military families as possible. Use the HTML code below to make it simple and easy. Simply select (highlight), copy & paste the HTML code from the box below, and place it wherever you'd like it to appear on your website or blog. A comprehensive guide to money matters for American military families, offering debt solutions, financial education, and money management tips and techniques, as well as other information of interest to military families. The link will open a new window to this site, so your website or blog will still be there underneath, for your visitors to return to automatically when they close the new window. 3. Social Bookmarking - Twitter, StumbleUpon, Facebook, MySpace, etc. You can also add this site, or any particular page of the site, to your favorite social bookmarking location by clicking on the appropriate links you'll find at the bottom of each page. We hope you'll help us spread the word about the helpful information you found here at www.Military-Money-Matters.com. Your vote of confidence means the world to us. We can't thank you enough for sharing this information with other military families. And if you still don't find it, drop us a note and tell us what you'd like to see covered here but didn't find. You might be the inspiration for a new article! Have you subscribed yet to our newsletter, My Military-Money-Matters? For more information about managing your money, and special tips for military families, sign up here. We promise not to clutter your inbox with junk. We send our newsletter only when we have something important to share with you. The easiest way to keep up with the latest articles posted at Military-Money-Matters.com is to subscribe to our blog via e-mail. By signing up here, you'll only get e-mail when we post a new article or entry on the site. We hate spam as much as you do!